We turned the calendar to May this morning and boom―the sun came out. With May Day, Cinco de Mayo and Mother’s Day all on the calendar, there is no reason to wait. Let’s celebrate. New England is coming alive! Bright orange, crisp white and golden daffodils are in bloom along the roadsides. Tiny purple flowers push up through the dirt toward the light. Spring chives, with their delicate flowers, stand tall, proudly becoming the first to sprout through the mulch in the herb garden. Birds sing wake up calls, in tune with the sound of our neighbors working in their gardens and the hum of cyclists whooshing by on the road below. With its fresh scents and warm touch, the air is welcoming on my skin as I write, seated on the patio Al built for us last fall, just before we put all the gardens to bed. I love it! I am happy. What is spring like in your part of the world? What do you like to eat at this glorious change of seasons? 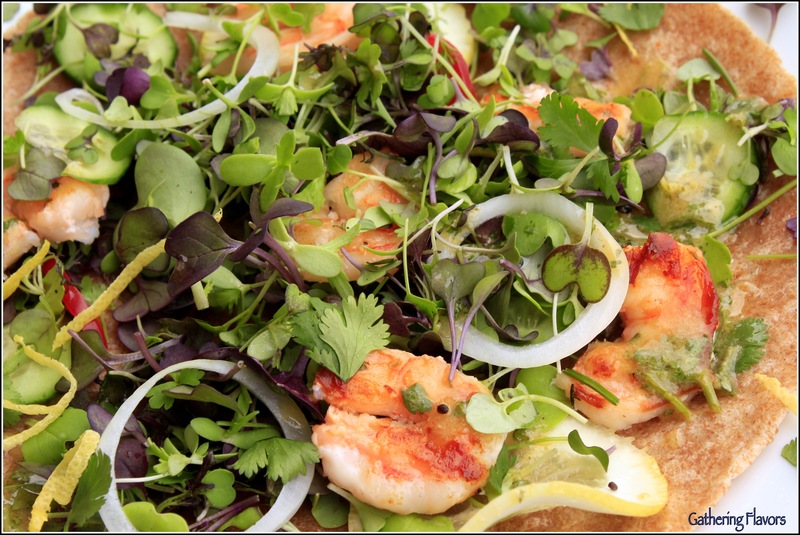 I created these Tacos with Spring Greens, Grilled Shrimp and Cilantro Vinaigrette with Cinco de Mayo in mind. Using our outdoor grill for the first time since last October, the shrimp were quickly grilled then bathed in a light sprinkling of fresh lemon juice and chopped chives. 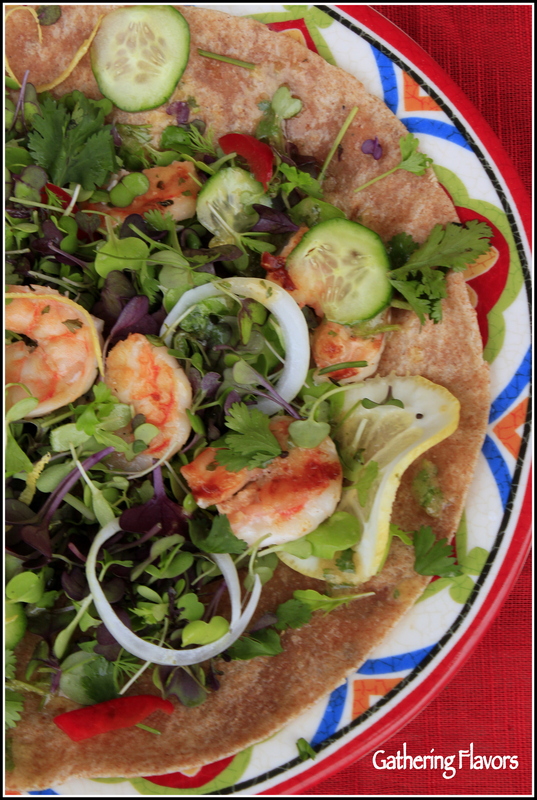 After toasting tortillas to give them a bit of crunch and smoky flavor, I topped them with spring greens and vegetables―micro-greens, dandelions, spring onions, red peppers, lemon zest―all lightly coated with a cilantro dressing. Garnished with the golden shrimp, these open-faced tacos are fit any celebration you choose. Make the vinaigrette by placing the mustard and lemon juice in a small bowl. Whisk together. Continue whisking while slowly drizzling the olive oil into the mixture. Whisk until the oil is fully incorporated. Add the pinch cumin, minced cilantro leaves, salt and freshly ground pepper. Whisk one more time and set aside. Place the shrimp on skewers, 4 to each skewer, and brush with olive oil. Grill the shrimp until they are golden on the outside and cooked through on the inside, about 5 minutes. (You will want to turn them at least once during the grilling process.) Remove from the heat, but leave the grill on. Place the shrimp on a plate. Drizzle with lemon juice, sprinkle with chopped chives, salt and pepper. Set aside. Carefully place the tortillas on the grill. (You can do them all at once or one at a time, depending on the size of your grill). Using a heat-proof spatula, flip them once. Leave them on the grill for just a few seconds on each side to toast them a bit. Place one tortilla on each of 4 dinner plates. Place all the prepared vegetables in a large mixing bowl. Toss with the vinaigrette. Add salt and freshly ground black pepper, to taste. To assemble the tacos, divide the dressed salad greens between each of the 4 tortillas. Remove the cooked shrimp from the skewers, place 4 on each of the salads. These are open-faced tacos. To make more traditional taco, place the ingredients on half of the prepared tortilla and fold over the unfilled side to form a pocket around the ingredients. To make a vegetarian dish, leave off the shrimp. Add grilled cubes of tofu in its place. To make a heartier dish, use grilled beef, chicken or pork instead of the shrimp. 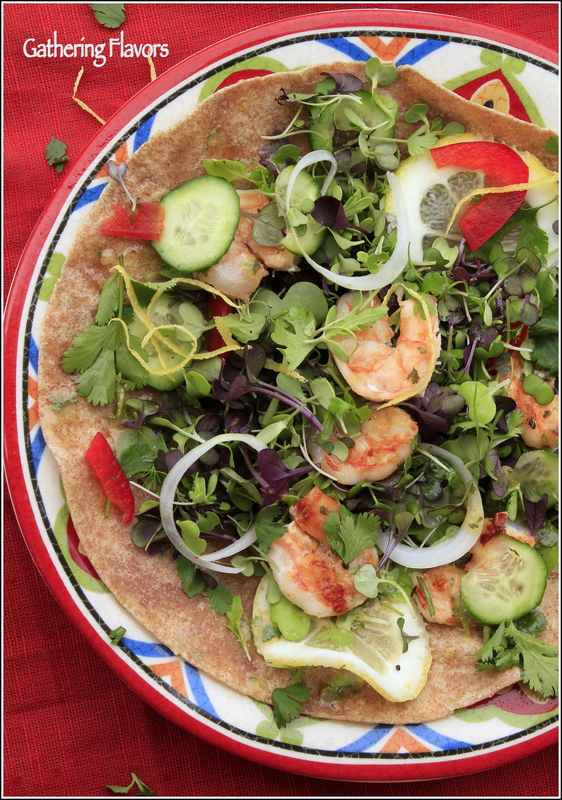 To serve family style or at a party buffet, prepare the shrimp and tortillas as directed. Place them on a serving platter. Put the vinaigrette in a small pitcher and all the remaining ingredients in small serving bowls. Allow your family to fill and dress their tacos as they like, just before eating.